You can find us from coral reefs to the deep sea (at depths over 19,000ft)! On sea floors from the poles to the tropics. Plankton, detritus and small animals like crustaceans. Upon first glance I may look like a starfish, but don’t be fooled! 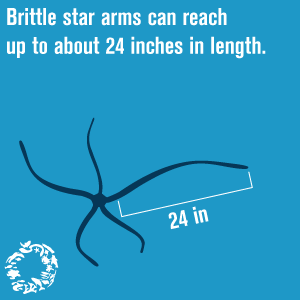 Although brittle stars and starfish are closely related, I’m like a quirkier, more slender version of a starfish. I have a distinct central disc and five skinny, flexible arms. My central disk is made up of a skeleton of calcium carbonate and contains all my internal organs. My five arms twist and coil to help me move across the seafloor. But that’s not the only thing they can help with: I can release one or more of my arms to escape a predator! As long as I hold on to my central disk, I can still function, and my limbs will regenerate. My mouth contains not one, not two, but five jaws! You can find us in a variety of habitats around the world. There are 73 species of us in the Arctic alone! There, we live at various depths, with some species occurring deeper than 3,500m. In the Alaskan Arctic, you can find most of us on shallower ocean shelf waters. Not to brag, but we play a pretty important role in the food web. We are known as “seafloor ecosystem engineers,” meaning we reshape the sediment shape on the seafloor, which in turn influences the distribution of other seafloor species. I use my mouth, which is found on the underbelly of my disk, to munch on small organisms and detritus. I can also filter feed organisms from the ocean water. 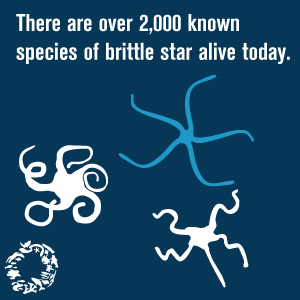 On the flip side, we provide nutrition to fish, sea stars and crab predators.